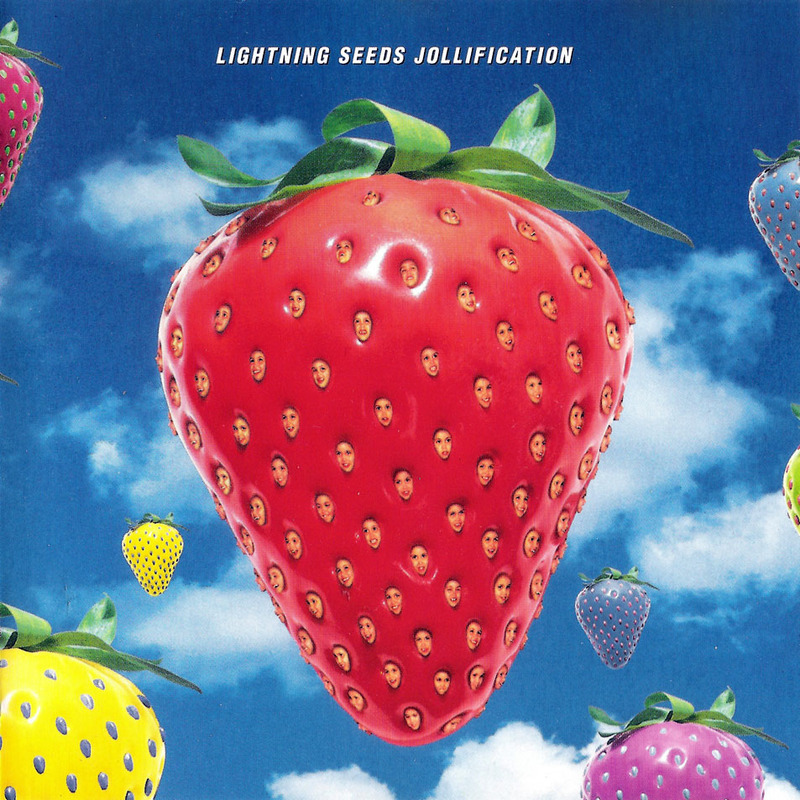 Today’s POP RESCUE is the hit 1994 third album Jollification by The Lightning Seeds. The Lightning Seeds were everywhere by 1994. They’d released a lot of singles that had charted moderately well, and they were constantly on TV. I remember selling this album by the bucket-load when I worked in a music store at the time. This 10 track album attracted contributions from Terry Hall and Alison Moyet amongst others. The album opens with fourth single Perfect, which is a gentle introduction to this Brit-pop album. Ian Broudie’s vocal style is unmistakeable – with him being a kind of ‘Baggy’ sounding left-over Beatle. Roaring in, is lead single Lucky You, which was co-written by Terry Hall. The pace is faster than Perfect, and the song is as catchy as hell. It’s unsurprising that this was a moderate hit…even though it took a re-release to achieve that (taking the single from #43 in August 1994, to #15 in October 1995). This is followed by Open Goals, which is rockier than the previous two tracks, but vocally reminds me of some timid/miserable 6th form school bands. This is definitely an album track, and sadly a bit lacklustre here amongst the other tracks so far. Second single Change is up next – thrashing in in the same way that Lucky You does.. in fact, fairly similarly. I can imagine an endless mega-mix called Lucky Change where it’s just the two songs together. Aside from that, it’s a pretty catchy song, and that was enough to make it the most successful single from the album – reaching #13 in the UK. Fifth track is Why, Why, Why and lead vocals are given to vocalist Marina Van-Rooy. There’s not many vocals here, and the track is more of a thumping dance track with drifting, dreaming vocals and vocal samples. I guess, that if this album was on LP or cassette, that this oddity would signal the end of side one. Up next is third single Marvellous, and i remember this being used in at least one car advert. For the first 1m 40s of the track, it feels like previous song has drifted along into this one. Suddenly the song blasts in with electronic brass section, beat, guitars and Ian’s vocals. This song is another great catchy number, and Marvellous is definitely far better than Perfect, even if UK chart placings say otherwise (#24 vs #18 respectively). Piano, drums and guitar lead us into the narrative track Feeling Lazy, a writing collaboration with Ian McNabb. If any of these tracks feels most Beatles, then it’s this – imagine Penny Lane and Sgt Pepper’s Lonely Heart’s Club Band. Eighth track is My Best Day, a collaboration with Alison Moyet. Some great samples and muted beats introduce the track underneath a synth. Ian and Alison’s vocals are brilliant together, although not massively different. Alison sounds wonderful here, and the track really bounces along. I’m sad that this didn’t make it as a single. Penultimate track Punch And Judy, opens with guitar and cello. Ian’s vocals are sounding really good here, with some more great vocal harmonies. However, the track breaks into a thumping beat at about 1m 54s, which kind of works, but not quite. Final track Telling Tales reminds me of a Christmas song meets Everybody’s Got To Learn Sometime as covered by Baby D at about the same period. This song sounds big – filled with sustained effects, samples, and instruments, particularly as it slowly fades out. Overall, the singles, and the Alison Moyet song really stand out here. The rest, feels like psychedelic dance padding. There’s some very slick production, and tracks, like Telling Tales feel somewhat over indulgent. Where are The Lightning Seeds now? After the success of this album, Ian Broudie went on to write number one UK single Three Lions with comedians Frank Skinner and David Badiel in 1996 after being approached by The Football Association. The dance sounds emerging within this album, emerged in full with their 1999 album Tilt, but singles from this album failed to repeat the same level of success. The group took a hiatus in 2000. Returning in 2006, further albums followed, with a ‘Very Best Of’ released in that same year, just as Three Lions scaled the charts again. Following several changes to the line-up (including a stint with former-Beatle Ringo Starr‘s son Zak Starkey on drums), in 2010 the band undertook a 22-date tour supporting Squeeze. However, they are yet to release any new material – with their most recent album being 2009’s Four Winds. 1994 UK CHART POSITION: #12, certified Platinum. Posted in 1990s, The Lightning SeedsTagged 1994, album, Alison Moyet, Britpop, Change, Ian Broudie, Ian McNabb, Jollification, Lucky You, Marina Van-Rooy, Marvellous, My Best Day, Perfect, review, Terry HallBookmark the permalink.